Marvelous Multiagers! : Fantastic Ocean Books! If I could teach every concept, all day long, every day, with children's books, I would! For whatever reason, my students are always SUPER engaged in books, where, if I sat there and said the same things to them, they would lose it. So children's books play a huge part in my teaching. I love them and so do my kiddos!! When I student taught, I had to plan a major unit, and between my cooperating teacher and myself, we decided to do an ocean unit and pull it all together by going to the Shedd Aquarium in Chicago! We studied a different underwater animal each day, and I remember two books specifically that I loved using! 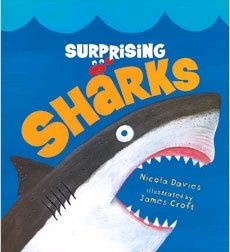 First, we have Surprising Sharks by Nicola Davies. My first graders LOVED THIS BOOK! There are no photographs of sharks, but the very detailed and cute illustrations serve as an appropriate substitute! Not only does this book include a ton of information on many different sharks, but it tries to combat the idea that we should be afraid of sharks by giving information about how many sharks are killed by humans every year. It's a super informative and fun book, and I think my library copy came with a CD? And second, I liked A Safe Home for Manatees by Priscilla Belz Jenkins. 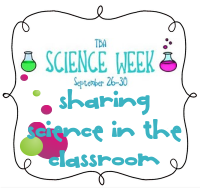 Check out Teaching Blog Addict's Science Week linky party today to find more awesome science books!! we love manatee's the shark book looks great too.